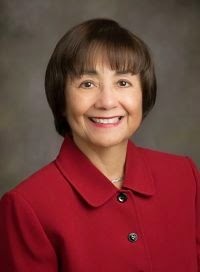 We’ve all faced challenges, and author/speaker Yvonne Ortega has faced more than her share. But she has persevered in trusting God and shares her wisdom with others. She is making her latest book, Moving From Broken to Beautiful, available for the winner of my book drawing. Check below to find out how you can put in your name. Here’s my interview with Yvonne to tell you about this wonderful new book. On the contrary. Notice that the subtitle is 9 Life Lessons to Help You Move Forward. The style of writing is positive and hopeful. Friends tell me my sense of humor keeps the message upbeat. 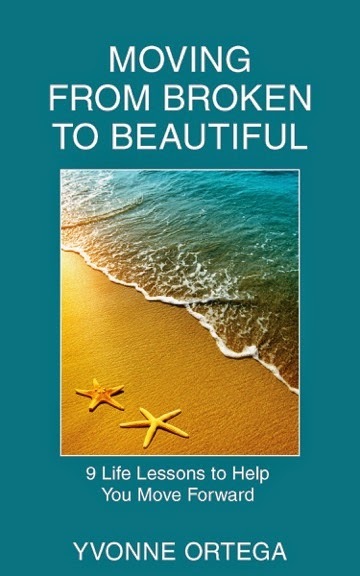 The introduction of Moving from Broken to Beautiful suggests how readers can utilize the book. At the end of each chapter, the readers will find three activities, three affirmations, three Scriptural readings, a prayer, and two pages to journal their thoughts and emotions about the life lesson in that chapter. The book emphasizes application of the life lessons. The book has 103 pages. Did you have a reason for keeping it short? Yes. People who are going through a major illness or some other crisis don’t have a lot of time to read. They want help and hope, but they want them quickly. Yvonne Ortega is a Licensed Professional Counselor, a Licensed Substance Abuse Treatment Practitioner, a Clinically Certified Domestic Violence Counselor, and bilingual professional speaker. She is the author of Moving from Broken to Beautiful: 9 Life Lessons to Help You Move Forward and Finding Hope for Your Journey through Breast Cancer (Revell). She’s also a contributing author to The Embrace of a Father and Transformed. Her website is www.yvonneortega.com. Yvonne is on the board for Christians in Recovery, speaks for Stonecroft Ministries, and is the Stonecroft Regional Speaker Trainer for Virginia. She loves to speak to audiences in either English or Spanish about her journey in moving from broken to beautiful and enjoys hearing from her readers. I’m glad Yvonne is willing to make a copy available to the winner of my drawing. Enter your name by making a comment on my blog or email me: KathyCollardMiller @ gmail.com (omit spaces). I’ll draw the winner on Friday evening, May 8th. When you make a comment on my blog, please check back to discover the winner since my system doesn’t provide me contact information to reach you. Good Evening dear friend! Getting closer to nailing down plans for our trip to LA, so looking forward to seeing you, and possibly meeting Larry, too! Goodness, so much catching up we have to do! I'll email you by the end of next week because I'll have all my arrangements made by the 5th. Small world! Yvonne is a member of my church! 🙂 And this past fall, I led worship one Saturday when we had a small women's conference and she spoke to our ladies. Thanks for entering your name, Shelly! And so excited about seeing you! Yeah! Glad you know Yvonne. She's a special lady. Congratulations, Shelly! You are the winner. I'll contact you privately to coordinate you getting the book. So glad you've already enjoyed and benefited from Yvonne's ministry!